I owe you an explanation. At some point over the next few months, there will be a shiny wonderful book (you remember books, right?) based on this blog. 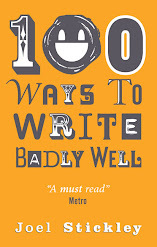 It may or may not be called 100 Ways To Write Badly Well. It will include both the best bits of this blog and all-new material. I’m pretty sure you’ll like it. The lack of updates here is partly down to me working on said book. The lack of updates in the near future will also be partly down to this. I’m going to mothball this site for a few months and relaunch it, new and improved, when the book’s ready. Sorry for not explaining this sooner. Don’t worry, though – it’s all going to turn out okay in the end, just like a predictably-plotted story. Those of you who have sent me suggestions for new blog posts are wonderful people and I can only apologise that those suggestions are being put on ice for a while (yes, ice and mothballs – what of it?). Thank you all so much. Just 100? We need MOOOOORRRRE! Do you know yet if it will be available on Kindle??? What sort of movie are you planning to make, and will there be a musical version of the live show at any point? You might also want to consider the Dash Gallant graphic novel as a side project. Rock on! I sense that this will be awesome. In regards to the suggestions let us ponder for a moment. Put together a book to please readers and earn money or concede to the whims of anonymous internet personages? Hmmmm. I think you're making the right choice. Thanks guys, I really appreciate the support. CT, a Dash Gallant graphic novel would be epic. The art style would have to be anatomically impossible bulging muscles and searingly bright space-lasers in pretty much every panel. The artist would also have to know how to interpret descriptions like “he glared masculinely at the visiscan monitor” with the appropriate level of testosterone-fuelled seriousness. Fishducky, although I haven’t had that discussion yet, I’m pretty sure a Kindle edition will happen. It certainly makes more sense for ereaders than my last book, which had all its careful design work and illustrations stripped out for the Kindle edition and became basically unreadable as a result. You will let us know when we can (pre-)order it, right? Can we order pre-signed copies? Will there be signing events? Maybe even *gasp* a BOOK TOUR? I'm ridiculously excited about this, as you can probably tell. Y-a-a-a-y... following on from CT's comments, there's also the soundtrack to the movie to compose and the subsequent spin-off book, How To Write Music Badly Well. You could then combine a book tour with the musical, the live shows, soundtrack orchestra gigs and take it all on the road. To, I dunno, Australia, or somewhere. Rob Liefeld. That's who you need for the graphic novel. Anyway, good luck, chief, I'm sure the book will be awesome. Oh, lovely that you're putting out a book -- I hope it sells insanely badlywell, and you make a fortune, and for the love of it all you *keep the blog alive*. Oooooh, I think I shall have to have a character named Badlywell in a new story. Yes, Joel Badlywell. Oooooooh. Hope it goes well. I watched your youtube videos and really enjoyed those. Will it be available to USians? Cough: I am new to this, having just been recommended this site by a great fan, so I may be missing an in joke, but.. it's "The lack of updates here is partly down to*my* working on said book." Amie, both me and my are standard in such constructions. Both forms first appeared before 1700, and have been used by authors writing in the standard language. Indeed, it is not uncommon for the same book to contain possessive and non-possessive forms quite close to each other. Both forms have been called incorrect, but in fact neither one is. I have a million (give or take a few) posts from your delightful blog linked at various and sundry places in my class website. Please tell me when you roll out the new blog the old posts (and therefore their old links) won't migrate someplace making my links...well, unlinked. Will it? p.s.--Super congrats on the book. Hi Kronzer. That's a good point – I'll make sure that everything on this site stays where it is, so no links will break.